In a fit of energy, Lesa convinced me posted about wanting new posters for her awesome blog. I read through the blog and thought, "Why not?" 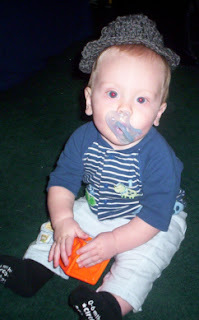 I wanted to be a bit more active on my own blog, which is ridiculously unloved. I thought by posting here semi-regularly, I would post there semi-regularly. So, that is my crime of passion. Well, that and crocheting. 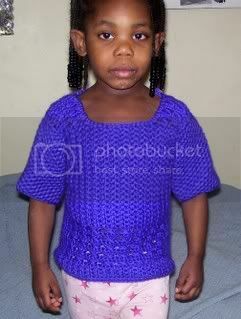 I think the crocheting part is obvious, though. My name is Renee. I live in Dayton, OH, which is a smallish metropolitan area north of Cincinnati. I am a graduate student taking a bit of a hiatus while I sort out some health issues. I study women's issues in nonwestern countries, particularly women's involvement with cults. Although, I'm sure none of you are actually interested in that particular aspect of me. My crocheting is probably a bit more interesting. I have been crocheting for a little over a year. My mother taught me after years of trying to learn how to knit. 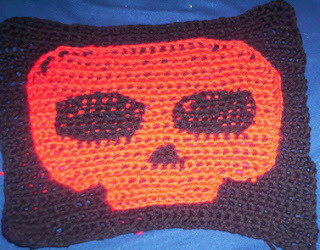 Knitting does not work, crocheting obviously did. I took to it immediately and have since become a bit ... enthusiastic. I crochet primarily "fannish" things. By this, I mean Harry Potter related items and other "fannish things." I also do commissions and gifties. I think the only real thing I ever crochet for myself are blankets (and scrapghans at that). 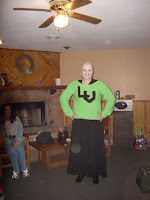 Beth cosplays Voldemort and so, she was a perfect person to try out the style on. Of course, it's funny as well. 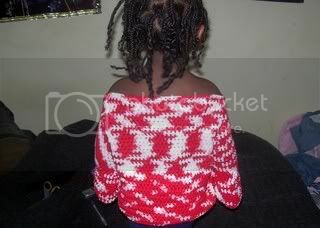 The sweater is done in sc with front, back and sleeves all separate. I sew it together using a sc instead of anything else to give it a bit of stiffness in the seams and help with the inside out thing for some folks whose letter is the same for both sides. On your right, is the portion of a cardigan I'm making for my roommate's holiday gift. She wanted something unique and interesting. What I'm doing is a cluster stitch. After a foundation row of sc, ch 2, pull a loop through the first sc, yo, pull a loop through the second, yo. Pull last yo through all four loops on hook. Ch1. That gives you the cluster pattern I am using. 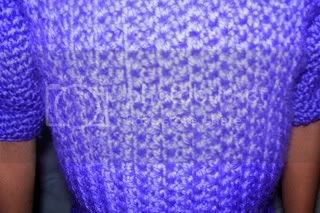 The fashioning of the sweater is going to be rather unique and hopefully my pattern will make sense to anyone else who reads it. 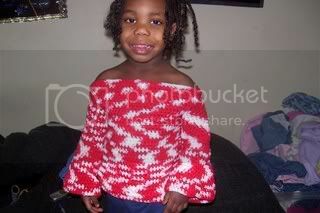 I'm making the sweater in the style of a robe. The piece to the right is the bottom all the way to just below the bust (right now). It will be solid all the way to the sleeve line. I'll leave space to insert the sleeve directly into the solid pattern. I will mold the front section directly off of the solid portion (man I wish I was better at this) and attach it to the neckline. 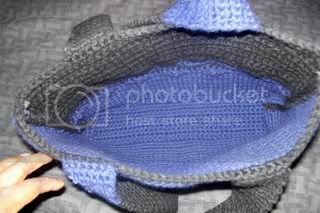 THEN - I plan to crochet a wide lapel collar that will continue down to hold the button and button holes. 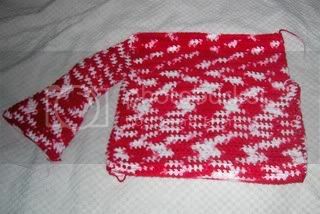 The sleeves and body of the sweater are in the cluster pattern. The lapel will probably be in sc to allow for a tighter weave and contrast. SO - that's the brilliant introduction of Renee to the Crochet Chicks. 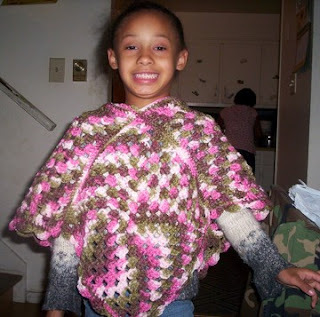 Hey everyone, my name is Rachel and I'm 19 (will be 20 in June) I've been crocheting since January but I first learned about 10 years ago thanks to my aunt. I have my own blog Yarn Talk and my own podcast with the same name (Although I'm in the middle of switching hosts so I'll post the new feed ASAP). Hope to have pictures up soon! So now here goes my moms purse. I haven't shown it to her just yet. 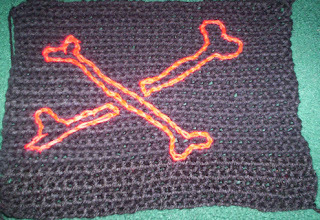 I love it I did start writing the pattern as I went but, then I fall off of writing I was so used to just crocheting that I stopped counting rows and gave up on writing it. So here it is. Love it. 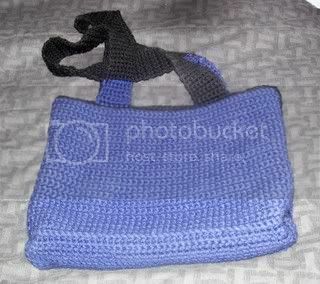 This purse is done all in one piece well the body of the purse is the back, front and bottom the straps are crochet on. 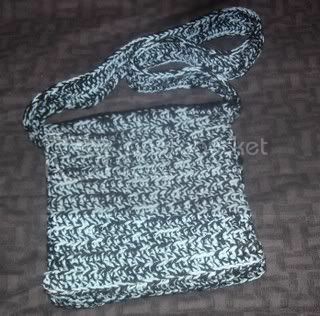 Ok now here goes my cousin messager bag. She's still in school and she said, she want something that will have a flap to it and go over her arm and head so here it goes. I didn't do a pattern to this but, it was so easy to do that next time I do one I will write it down as I go. 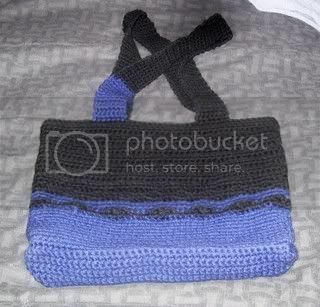 This purse was done in all one piece that is what makes it so simply and easy. 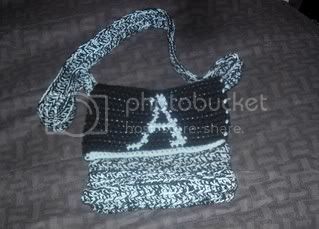 As you can see below the purse also has the letter A on it meaning my cousin name is Ariel. I haven't yet given it to her but, I know she will love it she seen all the other things I done before and just say Oooooooooo I want one. So there you have it my weekend. So here is my cousin's messager bag. The body of this bag is done in all one piece the flap, back, front and bottom. I then attached the strap. Done in double strands one strand black second strands blue thats for the whole body and strap. For the flap done in 2 strands black for the background and 2 strands light blue for the letter A. The double strands is to help give the bag more shape to it. 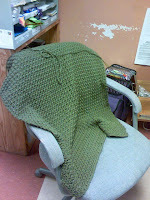 I've updated my blog with some new crochet projects I've done. 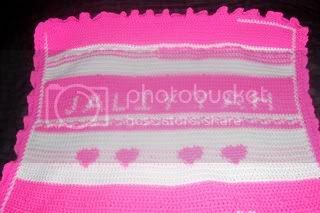 A Pretty In Pink blanket with hat and neckwarmer. Was happy to have done this for my niece I know she will love them all. It's been a while since I have been able to post, but I wanted to share these. 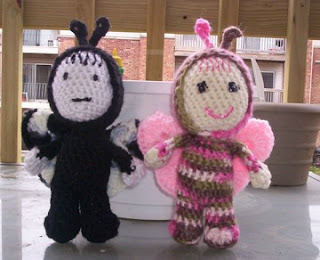 This group of knitted and crocheted food are part of a swap from swap-bot.com - Knit & Crochet Tasty Goodies. The recipient was also the co-ordinator and she said she was a fan of Harry Potter and loved miniature things. The candy cane is about 2 1/2" long to give you a bit of scale. I forgot to take a picture next to a coin. Here is the text of the letter that I sent along with the "goodies". Congratulations on being the recipient of the new Weasley Wizarding Wheezes Holiday sampler. This assortment of new W3 delights has been sent to you as a gift. Below, you will find a description of the new tasty treats and the resulting consequence of said morsels. Merry Mint Creams : The eater frequently Ho Ho Hos for a period of 3 hours. Red Reindeer Roll: The nose of the eater becomes a large round ball and glows with an inner red light for a period of 2 hours. Plum Party Pudding: The eater becomes the life of the party, with random occurrences of the following: whistles of steam erupting from his/her ears, glowing eyes, uncontrollable urges to dance an Irish Jig, and produce mistletoe in order to kiss strangers. The effect lasts approximately 3 1/3 hours. Frosty Candy Twist: The eater gains the power to chill glasses of pumpkin juice and butterbeer for a period of 1 hour. Please tell all of your friends about this great new holiday gift. We are currently accepting pre-orders now. My name is Laura, and I'm new to the blog. Thank you to Lesa for letting me join! I'm a 33 year old (almost 34, on December 26th!) married mom of two kids - my daughter who will be 10 in January, and my son who will be 5 in January. I live in (very cold!) Cleveland, OH, work full-time, and am a part-time grad student. I just learned how to crochet in March (taught myself with a learn to crochet DVD) and love it! 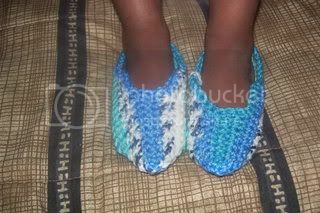 I wish that I had learned how to crochet years ago! Please come visit my blog at www.redhairedladycrochets.blogspot.com. 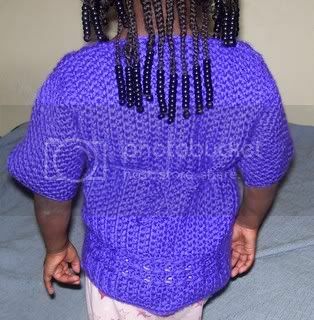 I didn't make it nearly as long as Doni's pattern suggests, because I think this length and weight is perfect for Grandma. 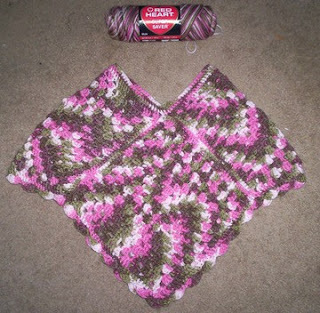 I used Caron Simply Soft and an "I" hook. Because I used a smaller hook and less bulky yarn, the stitches were tighter than in the original pattern, actually making the shawl pleasantly heavy and pretty warm. I used about 2 and a half skeins...approximately 15 ounces (about 425 grams). Close up on the first stitch I used. Loved this stitch first time using it love that it closes up the stitches very well hiding the wholes from the stitches. Close up on the second stitch I used. I also liked this one never done a slant stitch or work from one part of the stitching then find myself going back to a stitch that was slip to make the slant. 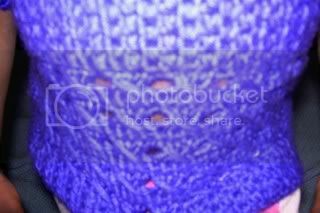 Like this stitch. I used it for the bottom of the shirt. This first one is for my 6 yr old goddaughter Sierra and you can see it's made from Red Heart Pink Camo. 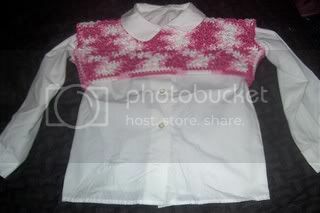 This one is for my 4 yr old goddaughter Lucy and it is made from Bernat Pink Camo. Here they both are together. Both are pink camo but very different colors. 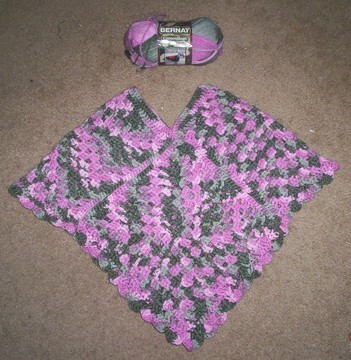 Both are made with four big granny squares sl st together and I added an edging around the neck and a shell edging along the bottom. 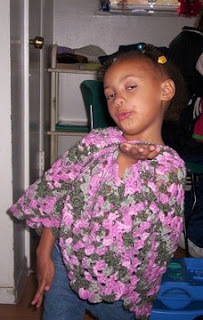 Here is Lucy blowing a kiss in her poncho she is such a ham. Here is Sierra being such a trooper despite having pink eye in her left eye. These two ponchos took me about 4 days due to working in between making them. Here are my butterfly gurls I did. 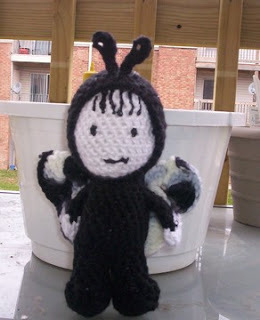 The pattern came from this site http://www.etsy.com/shop.php?user_id=5347491 she has such awesome patterns. She calles the pattern Fransica but mine are named different. That is the front of them. 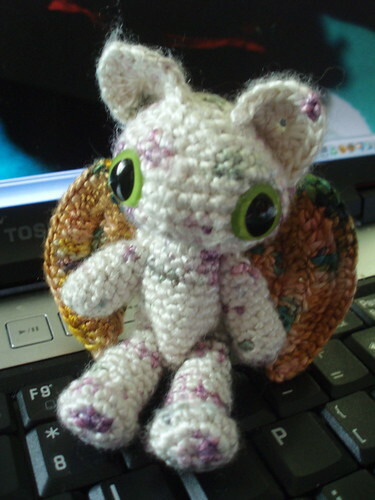 Here is the back of them showing thier wings which is different from the patterns wings. This one is Aiko (eye-co) she is dark and gothic so she wanted her wings black but no I decided to make them a variegated color. This is her happy colorful twin named Suki (sue-key) who is the total opposite of her twin but she loves her just the same. 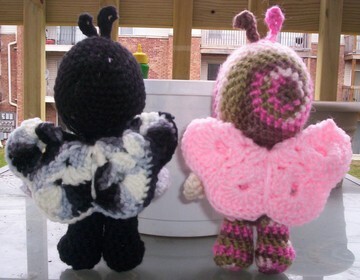 Both gurls are made with Red Heart yarns in Black and Zebra for Aiko and Pink Camo and Soft Pink for Suki. Aiko is made with Caron Simply Soft in True White for her skin and Suki is an Off White colored yarn I got from the thrift shop for her skin. 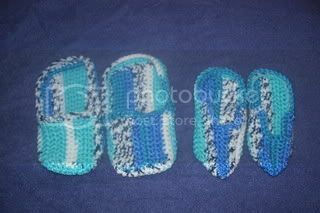 These patterns are easy and fun you should go to the link I provided and buy some of her patterns you won't be disappointed. The last few weeks have been crazy warm and its been difficult to get into making winter items. Finally, on Wednesday the temperature dropped a little and I can finally get into cold weather spirit. 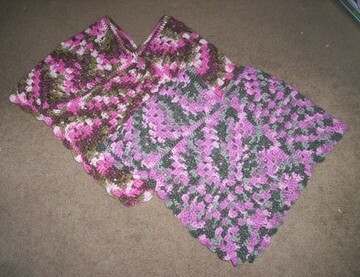 Here is a scarf I made with Patons Classic Merino Wool yarn. Love this stuff! I didn't use a pattern...just chained 163 and double crocheted for 10 rows, changing colors on the 3rd and 5th row. I have 2 projects on the go right now. Working on a felted purse, can't wait to get to the felting part cause I haven't tried that before. Also working on a doily, one of Annie's Attic freebies, for my mother-in-law for a Christmas gift. 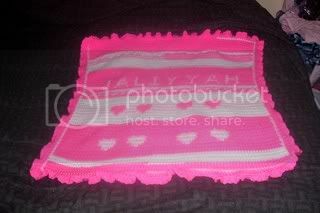 Hopefully can work on the purse this weekend and then get busy with the doily. Glad to see you are all working away. Hi Ladies! 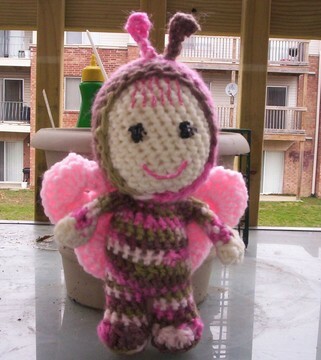 My name is Christina and I'm the newest member of Crochet Chicks! Lesa invited me over and I'm very happy to join! I'm from NYC, 26 (soon to be 27), married, have a 7 year old daughter (lovingly referred to as Little Monster on my blog) and work full time. I've been crocheting since I was 14 and love how crochet just relaxes me. I also have a blog that I update pretty often. Come visit me at Crafty Christina. 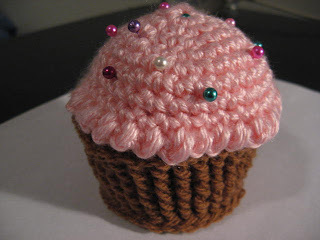 Here's my latest project, a cupcake pincushion. Thanks for letting me join this fun group! I just joined today and Lesa was nice enough to let me on. Thanks, Lesa! I knit, crochet, bead/make jewelry, cross stitch, latch hook, embroider and whatever craft tickles my fancy at the moment. My blog is CC's Spot . 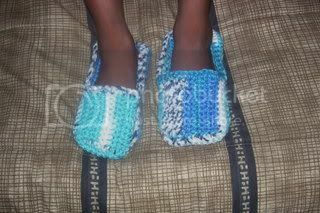 You can see my a pic of my latest cro creations. The items were from two Hogwarts Swaps of objects related to Harry Potter. More images and an explanation are on my blog. I update my blog more often, but I will strive to add to this one as well. My Latest Project for my oldest daughter. 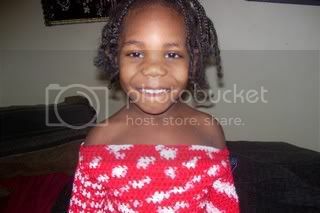 I brought this plain white shirt of my daughter. 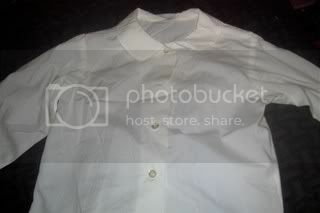 I really don't like these shirts because it's so plain but, I still buy them to jazz the shirts up a bit. 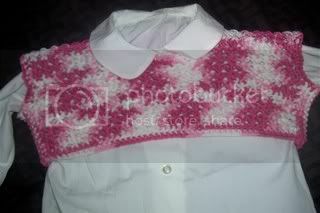 Like dye it or give it a little glamour and spice to it but, this time I wanted to crochet a bolero for it. :) So here is the before and now the after. 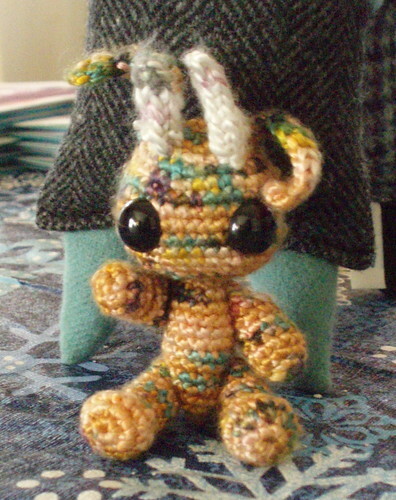 Cosmos the Jackalope, and Nebula the Kittyhawk. 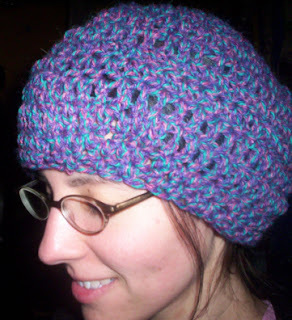 I heard that hats can be crocheted in one night. So I decided I should have a crochet a hat evening. On Tuesday, I tested this out on my knitting/crochet night to make sure it was possible. I got 12 rows out of 19 done in one night along with trying to teach a friend how to crochet and read a pattern (she didn't get very far). 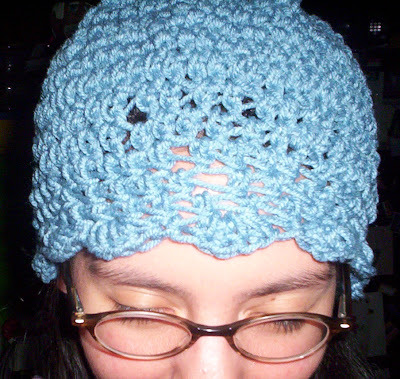 The other 7 I finished last night, in total I think it took 3 hours and 45 minutes to crochet the hat. It's kind of a goofy hat, so if you want it, happy birthday to you. I didn't have time to go out and buy yarn, so I just used some yarn from my crazy yarn basket. The pattern called for an H hook. Of course I changed the pattern as I worked it (I'm a control freak I guess). Here is my updated pattern. Starting with the center top of hat, chain 5. Join the chain with a slip st so that you have a ring. Chain 2 and count this as first st on first row. ROW 1 Work 9 hdc in the ring (or you can use a single or double crochet st depending on the yarn and what effect you want to achieve). Join last st to first with a slip st and chain 2 which makes the first st of row 2. (chain 2 will be 1st st on each row). ROW3 Chain 2, one st in first st, two sts in the next st (increase by one st every other st. Do this all the way around). Join as in row 1. Row 4 Chain 2, crochet around making 2 sts in every 3rd st (increase made), one st in the st in between. Row 5 Chain 2, increase ( 2 sts) in every 4th st around. Row 6-8 Chain 2, increase ( 2 sts) in every 5th st around. Row 9 Decrease every 3rd st by skipping each 3rd st. Crochet in all others around. Row 10-11 Hdc in every st around.Row 12 Hdc around, Increase in every 5th st around. ROW 13 14 Hdc in every st around. ROW 15 Repeat row 9. Row 16 Hdc in every st around. Row 17 Hdc around. Decrease every 5th st by skipping each 5th st around.After joining with slip st, do not make a chain 2 stitch. Row 18 Hdc around. Decrease every 5th st.
ROW 19 Shell Border: Make 5 hdc in next st Skip a st, slip st in next st.*Skip a st, make 5 hdc in next st, skip a st, slip st in next st.(Repeat from asterik around.) 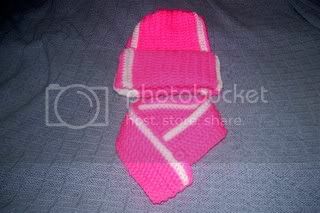 Join; cut yarn; tie off; weave tail into hat so it doesn't show.